Celebrate this festive season with nothing other than a well prepared, moist and tender turkey! We’ve come up with this amazing recipe flavored with the aromas of rosemary and lemon for a truly memorable festive family meal! This amazing turkey glazing will keep the meat nice and soft while roasting and give it an amazing rosemary infused scent! Yum! To ensure your amazing festive turkey is thoroughly cooked the first thing you need to do is let it sit at room temperature for about an hour. That-way the meat will be the same temperature throughout and cooked evenly. Preheat your oven at 400F (200C) with the rack placed in the lower third of the oven. You don’t want this amazing festive turkey to get burned, do you? Now its time to prepare the glazing. In a small saucepan heat the oil till hot but not enough to cause the ingredients to sizzle. Place the rosemary, garlic and lemon zest and bring to a simmer over medium heat. Cook until the lemon is slightly shriveled and garlic is soft. It should take about 2-3 minutes. Remove the glazing from the heat and let it cool. Now its time to start preparing your amazing festive turkey! Start by tucking its wing tips underneath the body. Season on the inside with plenty of pepper and some salt – careful not to make it too salty though! Fill stuff the turkey with your stuffing, fold the neck skin over the opening and tie the legs together with a kitchen twine. Now for the glazing. Brush your amazing festive turkey with 1/2 cup of the rosemary-lemon oil and sprinkle some salt and pepper. Peal your onions in quarters and layer them on the bottom of a heavy roasting pan. 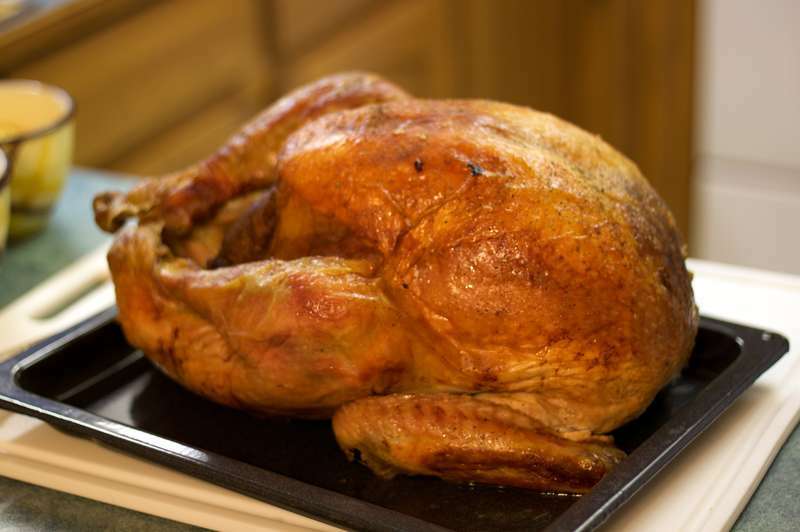 Place your roasting rack on top followed by your perfectly seasoned and glazed festive turkey! Roast until the turkey is golden brown. It will take about 45 minutes to 1 hour. To keep it nice and moist reduce heat to 375F (190C), add 1 cup of water to the pan, brush with the rosemary oil. Remember to cover with a lid or foil at this stage. Repeat every 30 minutes. If the pan becomes dry remember to add some more water. The best way to know when your festive turkey is done is using a meat thermometer in the thickest part of the thigh. If it reads 165F (73C) its done! Looking for the perfect side to your perfect festive turkey? Try these super tasty, fluffy and crispy lemon potatoes! Click here for more.